Our fully air-conditioned Fitness Suites benefit from revolutionary Cardiovascular and Weight Resistance Technogym equipment, allowing you to track and monitor your workout at home as well as in the Gym. All workout data is stored on your own personal Technogym Wellness Key which can be used to access the Technogym mywellness cloud through your computer or via the mywellness App! One fitness induction is complusory and is by appointment only. Comfortable clothing should be worn as exercise will be undertaken during this session. Please ensure that you have read the Fitness Suite & Free Weights etiquette before attending. Click here to view the etiquette. Have you downloaded our FREE Impulse Leisure app? Keep up to date with all of our Social Media pages through the click of button taking you straight to our Facebook, Twitter and Instagram pages. Share bookings, news and offers with friends and family. 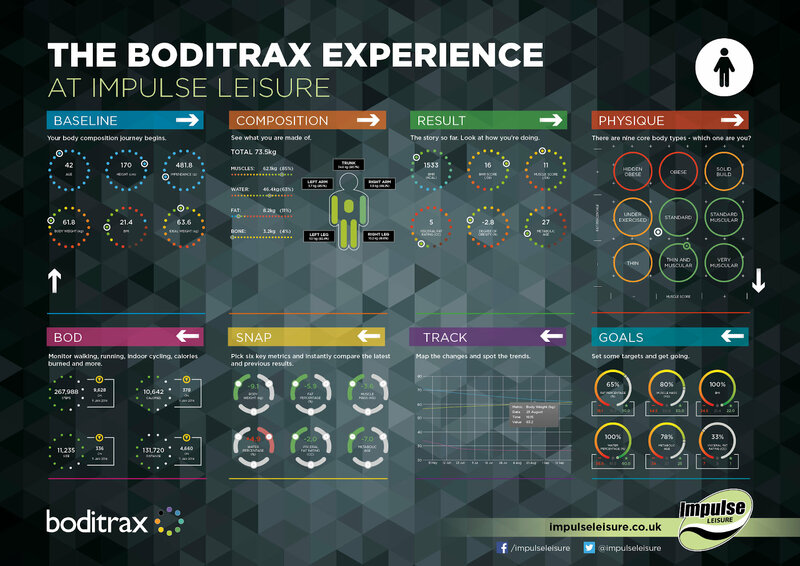 Boditrax measures and categorises weight into body fat mass, fat free mass, bone mass and total body water - all in a matter of seconds. You can track your changes, trace movement and share outcomes for long term health management. Please speak to a Fitness Instructor before using the Boditrax equipment. Discover how your daily activities keep you fit and healthy by tracking everything you do, wherever you go. Add exercises to increase your performance, check tips from our Fitness Instructors when you are at home or even challenge your friends! Click here to go to the Technogym mywellness cloud. Limited Time Offer: Get three 30 minute sessions for £45! If you're serious about working out and you want some 1-2-1 motivation, our Lime Personal Trainers can help you push to the next level of fitness. A Lime Personal Trainer will transform your workout. It sounds simple but the motivation, advice and help they provide will give you an amazing boost. Whether you're looking to lose weight, tone or increase your general fitness regime, our trainers will make sure every second of your workout is working for you. Your entire life and wellbeing will benefit too – not just your fitness regime. Your Lime Personal Trainer will give you specialist advice on nutrition and lifestyle changes, helping you achieve your goals even faster. All our Personal Trainers are qualified to REPs level 3 (Register of Exercise Professionals). They are friendly, supportive experts. They will work with you to find the best way for you to workout – and make sure you still enjoy it. Whether you have a short term goal of being slimmer for your holiday or a long term goal of improving your general health by reducing your body fat and controlling your weight we can help. Great health is not just about exercise, your general wellbeing can be enhanced with a holistic approach from your personal trainer. Our Lime Personal Trainers are extremely knowledgeable in nutrition and will be able to help you get on the right track when it comes to eating healthy. If you would like to lose weight or simply have a more nutritious diet to compliment your bespoke fitness regime, ask your Lime Personal Trainer for advice. The abdominal wall has many different layers of muscles and in order to get the best results, we must work all of these together. This improves the body's ability to support and protect the lower back, whilst making the entire body stronger for any activity. Your Lime Personal Trainers are here to show you a number of exercises that can be carried out and give you the flat stomach you desire. Your Lime Personal Trainer will help you understand how to manipulate all the parameters of your training, using many different training techniques and styles to make sure you attain significant strength gains and reach your performance potential. Following a progressive training program that continually challenges the muscles and forces them to adapt will ensure you never plateau with your strength gains. For more information or for one of our Lime Personal Trainers to contact you, please email us at limePT@impulseleisure.co.uk and make sure to include which Centre you are planning to use so we can assign an appropriate trainer. Exercise on Referral is a programme designed to enable GP’s and other professionals to refer people who were previously sedentary or inactive and have existing health conditions or other factors that put them at increased risk of ill health, into physical activity. The programme provides an appropriate range of physical activity options enabling participants to work towards long term lifestyle change and take control of their own health. The activities are provided in a safe and effective environment with fully qualified staff. We are proud to be leading an exciting new Active for Life programme which has just launched in Basildon, Brentwood and Thurrock that will support over 200 cancer patients to live healthier, more active lifestyles. To take part in one of our programmes, contact your GP or referral pathway.